My sister-in-law and her boyfriend made these over the summer. I don’t know who’s idea this was, but i’m going to ask for the recipe. They tasted better than they looked. Which says a lot, because they’re beautiful. I really wish I could make my food look, and taste, half as good as theirs. Start with your pot on medium head an melt 2 tablespoons of the butter to coat the bottom. Saute the green pepprer, poblano, and onion until softened. 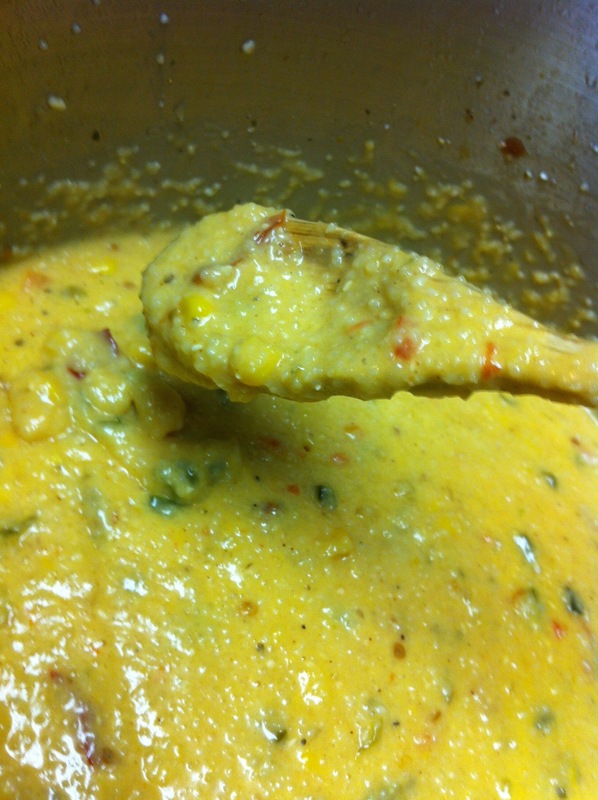 Bring the heat to medium-high and add the rotel, corn, and chipotles in adobo. Continue to saute until fragrant (about 5 minutes.) Pour all three cans of the chicken broth into the pan and make sure to to scrape up any browned bits on the bottom. Add the evaporated milk, salt, pepper, garlic powder and the remainder of the butter and bring the pot to a boil. Once boiling, hold the pot at a boil for 5-7 minutes before adding the grits. Cook grits according to package directions. Once they have cooked completely you might need to add up to a 1/2 cup of whole milk to achieve the consistency you desire. Lastly, mix the cheddar in one palmful at a time until incorporated. Serve immediately. Here’s an unused photo from last summer. Have you ever seen one of these before? I bet if you’ve ever had purple thumbs for three days you might have wished for one! 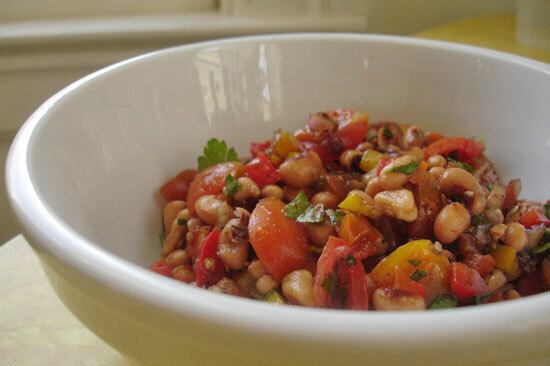 Here’s a quick, simple, recipe for Alabama Caviar (or black-eyed pea salad if you must.) It’s full of bright, bold flavors that fit in perfectly well at a picnic or a summer covered-dish dinner. There are probably hundreds of recipes out there, but I made this one with a few special ingredients that give it a twist. It’s simple, healthy, and relatively inexpensive. 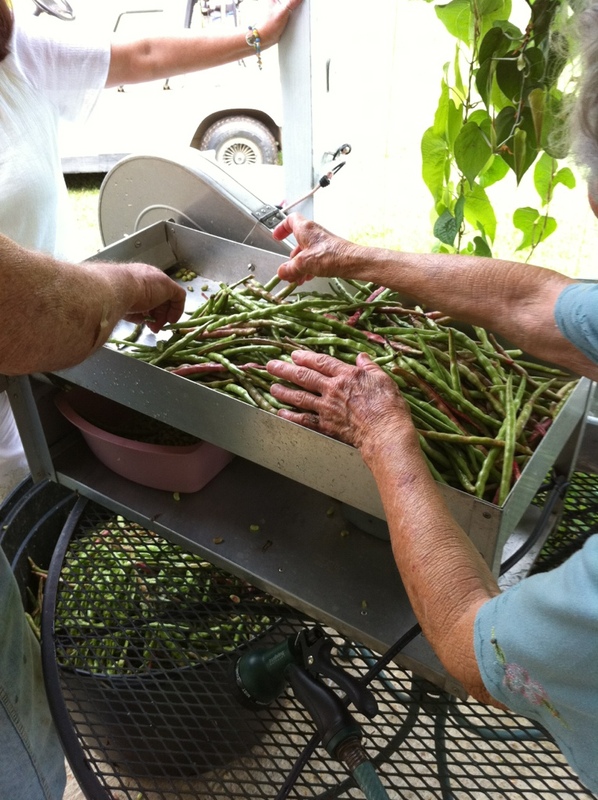 For a spicier dish, add 2 more Jalapenos, sub the mild pickled okra for hot, and increase the hot sauce amount to 3 tablespoons. 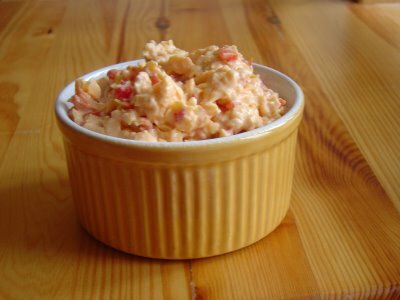 Image Credit: "A Trip Down South"
…not “pimento cheese dip,” or “pimento cheese spread,” but “pimento cheese.” If you’re a non-southerner, and you want to ask a dyed-in-the-wool southerner what this much revered dish is, make sure you just refer to it as “pimento cheese.” “Dip,” and “spread” are only verbs to us. We find no need for an adjective to describe the proper procedure for using it. We’re quite well versed in it’s ability slather on, dip in, or dump over just about anything. We also don’t care that referring to the dish as “pimento cheese” is a complete misnomer. If you’re expecting a block of cheese filled with pepper pieces, go look for some pepper jack, you won’t find it here. So what is this marvel of southern design? This versatile carrier in which half the things in your house would benefit from it’s unique taste? (Crackers, veggies, meats, the doorknob… whatever’s handy…) Surely anything this good requires a full page of ingredients, hours of prep, and a lifetime of dedication to master it’s subtle nuances. It’s sharp cheddar, mayo and jarred pimento peppers. Mix all ingredients, cover and refrigerate for at least an hour to let the flavors meld. Now, this may seem to be the epitome of backwoods, redneck cuisine. Especially to the untrained eye. But, believe it or not, a pimento cheese sandwich is THE thing to eat at one of the most prestigious golf tournaments in the world. The Masters, held every year in Augusta, Georgia. Only something so special, so southern, and so tasty, can not only appeal to the masses, but can appeal to those who could afford to eat it on a golden plate with a platinum knife. From golfers, to spectators, to sponsors, everyone lines up to taste the one of the simplest staples of southern comfort food. But, they do modify the recipe slightly. 4 Slices of White-Wheat bread. Salt and or Pepper to taste. Follow the base instructions for making pimento cheese (but remember to add the hot pepper sauce.) Once it has been well chilled, and the flavors have combined, spread pimento cheese evenly on bread. Top with onions and watercress sprigs. As you can see, The Masters makes use of the base recipe and adds the flavors of red pepper, sweet onion and watercress. I would suggest that you experiment with other flavors as well. Jalapeño and garlic tend to be very popular additions in mass produced pimento cheese, and their flavors blend even better when incorporated into fresh pimento cheese. Simplicity is the rule of the day when it comes to pimento cheese. It’s simple to make, simple to modify, and simple to serve. Therefore, I humbly suggest the next time you’re in the grocery store, bypass the Mrs. Stratton’s and try it the old fashioned way. The difference between fresh pimento cheese, and the pasturized, processed stuff that comes in a plastic tub will rock your tastebuds. I’m pretty sure you’ll never go back. Cream pimento cheese in food processor (add a little milk if too thick). With a star tipped icing bag, pipe the puree into vegetables (pepper slices, tomato cups, celery ribs) Garnish with a dusting of minced parsley. Top Ritz crackers, with thin Vidalia onion slices, cherry tomatoes (sliced into discs) and piped pimento cheese puree. Garnish with a small parsley sprig, or an olive ring. Delicata Squash: A Small Winter Wonder. Delicata Squash also called the Peanut, Bohemian, or Sweet-Potato Squash, is a winter heirloom with a sweet, delicate and nutty flavor. Originally introduced in New York, in 1894, the squash fell into obscurity after the 1920’s and has since come back with vigor in farmers markets across the U.S. The flesh, though firm, has a flavor of a sweet potato crossed with a peanut (hence the nicknames) and cooks to a wonderful creamy consistency, with a sponge-cake like appearance. It’s notoriously thin skinned, but varietal growers, and improved storage and transporation methods have made it easier for this squash to reach many different communities outside of it’s normal range. Best of all, the skin is edible. When cooked, the skin takes on the texture of eggplant skin, and helps to hold the delicate flesh together. The squash can be steamed, or fried, but my preferred method is pan roasting. Slice the squash across the grain in 1/2 to 3/4 inch thick slices, and scoop out the seeds to form a nice donut shaped service. Toss in olive oil, and sprinkle with kosher salt, dried herbs (I used Herbes de Provence) and then sprinkle with grated Parmigiano-Reggiano cheese. Place on a parchment lined sheet pan, and bake in a 400 degree oven for 30-35 min, or until golden brown. The results are a salty, sweet, nutty winter delight.